You can find Episode 24 on PodBean, iTunes, or Stitcher! Our most recent episode is worth taking your time with because it deals with many people’s favorite slow-mo animals: sloths! We take a look at the modern and fossil representatives of this weird group. The Society of Vertebrate Paleontology, along with several other organizations, are planning to sue the US Presidential administration over the decision to downsize two national monuments in Utah. More info here and here. Modern sloths come in two varieties: the toe-toed Choloepus, or the three-toed Bradypus. Their modern diversity only consists of six species, all of which are found in the forests of South America. These peculiar animals stand out from most mammals in a number of their physical features, such as being the only mammals (along with the manatee) to not have exactly seven cervical (neck) vertebrae. They also have amazingly slow metabolisms, allowing their internal temperatures to fluctuate more than most mammals. Pictured is a two-toed (left) and three-toed (right) sloth. Images modified from Dave Pape (left) and Stefan Laude (right) from Wikimedia. Sloths are members of the clade Xenarthra, alongside armadillos and anteaters. Xenarthra means “strange joints” in reference to the unique attachments on their vertebrae. Members of this groups also very commonly have large claws on their forelimbs and unusually-shaped hip bones. Armadillos (left) are part of the family Dasypodidae while anteaters (right) are in the suborder Vermilingua. Images modified from Jerry Seagraves (left) and 350z33 (right) Wikimedia. One very interesting group of fossil xenarthrans are the giant armored glyptodonts of North and South America. These tank-like animals survived up until very recent times, even living alongside – and being hunted by – our ancestors. Glyptodonts were cousins of armadillos. Some could be 10 feet long and almost 5 feet tall at the top of their domed shells. Image by Arent from Wikimedia. Before the last major period of glaciation, sloths had a much wider diversity and lived in a larger range of habitats. In the past most sloths were ground-dwelling herbivores that ranged from human-sized or smaller all the way to the size of a small elephant. Like their other xenarthran cousins, most of their history took place in South America, though many moved into North America later. Most sloths are thought to have been herbivores, using their large claws and ability to stand bipedally to grasp at branches. Image by ДиБгд from Wikimedia. Megalonyx jeffersonii is famous for being discovered – and ultimately named for – one of the United States’ founding fathers, Thomas Jefferson. Image by MCDinosaurhunter form Wikimedia. This family included the largest species of sloths that were also some of the biggest land mammals to ever have walked the earth. 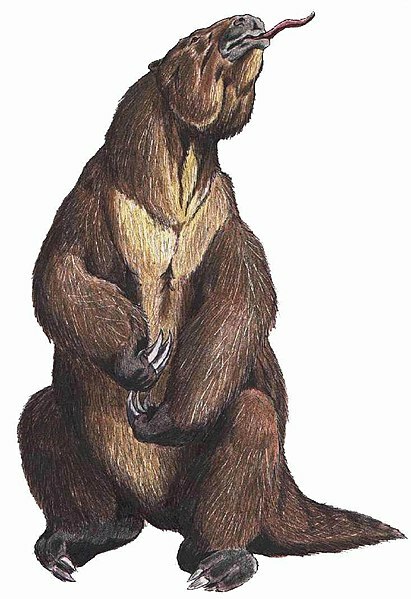 Megatherium reached 20 feet long and is estimated to have weighed over four tons. The only animals in its environment that outweighed it were proboscideans (elephants and kin). Megatherium americanum possessed unique arms that seemed designed for quicker movements instead of strength. These, along with its large claws, would have made for some dangerous weapons. Image by Ballista form Wikimedia. Among this family of mostly smaller sloths was the genus Thalassocnus, which appeared to have been uniquely adapted to an aquatic lifestyle. Fossils of Thalassocnus are found among the same layers as marine organisms and their physical features would have supported a life in the water. A specimen of Thalassocnus posed in a swimming posture. Image by FunkMonk from Wikimedia. With wide, flat claws and very robust forearms, these ground sloths appear to have been prominent burrowers, and are likely to have left behind the mysterious ancient tunnels discovered throughout South America. These sloths are also notable because many of the mylodontids possessed osteoderms – pieces of bone that grew within the skin as a form of armor. These have even been found in mummified sloth skin from cave sites. Paramylodon. Image by Skb8721 form Wikimedia. Your photo of Megaloynx is actually Paramylodon. It is horribly mislabeled at that museum. A fact I made a bit of to do about during SVP in Salt Lake City. Thank you for catching that and letting us know. You’re definitely right and we’ve updated the photo. Glad to help. Sloths are kinda my thing, so looking forward to listening to this episode. Have overall heard good things about your podcasts! Thanks again! Hope you enjoy and approve!